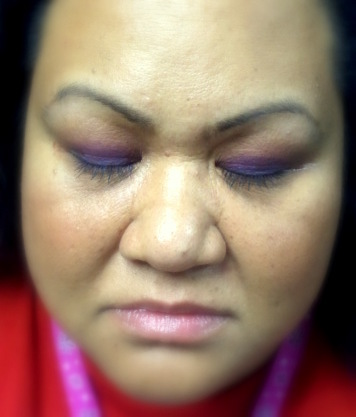 The make up artist who did this purple goodness to my face can be found >>>>HERE<<<< . I am calling this Purple Rain... in honor of one of my favorite entertainers of all time... PRINCE!! I hung out with some Young Women last night and we played with make-up. They're getting ready for prom. I was just fooling around. This was a definite break from the norm. Most of the girls and women that were there playing with make-up have the same Asian-Eyelid thing going on where there isn't a crease in the eyelid. This normally means that if I put on makeup, you can't see it unless I close my eyes. This is why my eyes are closed in this picture. When I was younger, I hated putting on my make-up. My mother was very "girly-girl". She attended and graduated from Beauty School. Naturally, she wanted a daughter that would be interested in the same thing but I so wasn't! I was such a tomboy as soon as I came out of the womb. LOL. Sorry Mom! ahahahaha. But I find that I kinda like playing with make-up. I love the colors. I love how "girly" or "womanly" I feel. So anyway, this is my homage to MAKE-UP. My sis-in-law would be so proud.... she loves make-up also.